Sound and vibration have an incredible capacity to facilitate the healing process. Sound Medicine is a form of energy healing based on the idea that when vibration shifts, healing and integration can occur, and states of deep peace and rejuvenation may result. Like all forms of energy healing, Sound Medicine works with the principle that disturbances within the body begin as energetic imbalances, and through the intentional and skillful application of music, sound, and vibration, balance can be restored. 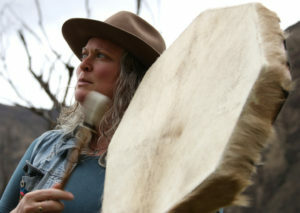 Angela Blueskies created her unique approach to Sound Medicine as a fusion of two distinct sacred sound traditions, Nada Yoga and Shamanic Healing, and in her work, she unites the pure energy of sound with the intention to facilitate healing for body and mind. With her background as a classically trained musician, she creates sound environments with a superb level of refinement and sensitivity. Weaving together the heartbeat of the drum with the rich resonance of Himalayan singing bowls; the lush, gentle sounds of 12-string guitar; the celestial tones of handmade chimes and crystal singing bowls; the radiant warmth of the flute; the powerful vibrations of the Gong; and an engaging selection of traditional and original songs to uplift and awaken, Angela Blueskies brings a level of artistry to the discipline of sound healing that is rarely matched. Sound Medicine Journeys are inspired by both the tradition of shamanic drum journeying, as well as savasana at the end of a yoga session. Participants are guided into a comfortable and receptive state to support deep relaxation. 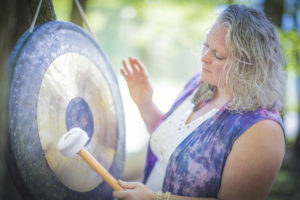 Using a lush array of sounds, including voice, toning, and mantra, as well as drum, guitar, flute, singing bowls, and the gong, participants are bathed in healing sounds and music designed to create a deep sense of relaxation and well being. During a Journey, it is possible to release accumulated stress, heaviness, and tension, allowing the body to naturally shift into a regenerative state, bringing healing energy to mind, body, and spirit. Sessions typically last between 90 minutes and 2 hours. Of all the instruments used in sound healing, the Gong is perhaps the most powerful, and the most mysterious. 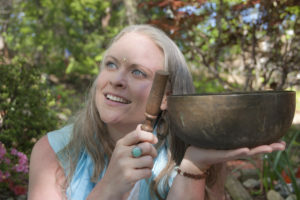 Used in ancient Chinese palaces and temples, and also in the tradition of Kundalini Yoga, Gong Medicine Journeys, also called Gong Baths, are deeply nourishing and restorative. The Gong possesses a unique tonality, with rich and complex harmonics that emulate an incredible array of sounds. Using a variety of rhythmic patterns and techniques, as well as mallets and other tools, it is possible to evoke sounds of whale song, deep space, the ocean (both above and below water), a baby’s whimper, antiphonal trumpets and piccolos, thunderstorms, choirs of both angels and demons, and more. Without any discernible melodic or harmonic qualities to hold on to, the mind surrenders to the intense vibrations of the sound, allowing the body to relax into the healing energies of the Gong. As waves of sound wash over participants, the fight-or-flight stress response shifts into deep relaxation. The parasympathetic nervous system is engaged and a deep energetic clearing occurs, leaving participants feeling balanced, peaceful, and light. Sessions typically last between 75 and 90 minutes. In recent years, Sound Medicine has been making headlines. Instead of heading out to the pub on a Friday night, many people are now choosing sound journeys as a way to relax and unwind. To those who view music as nothing more than entertainment, Sound Medicine may sound like a New Age gimmick, and even those who have experienced the benefits of healing sound may struggle to explain what exactly happens during a session. In light of this, it is helpful to consider the history of sound healing, as well as the science behind its effectiveness. In western culture, people often assume that Sound Medicine is an emerging field, however cultures around the world have practiced sound healing for millenia. The indigenous people of the Amazon have long used medicine songs called icaros in plant medicine healing. The pre-Hindu Tantric Yogis used potent sound meditations to heal and awaken. Chinese Medicine and Ayurveda use sound for both diagnostic and treatment purposes, and in ancient Greece, Pythagoras cultivated practices based on the Harmony of the Spheres. Indeed, Sound Medicine is hardly an innovation of the New Age. Sound Medicine is much more than a relaxing concert. 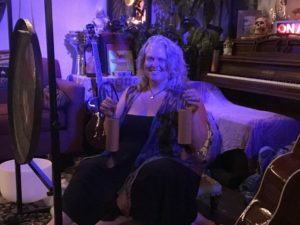 With artistic mastery of their chosen tools and instruments guiding the experience, as well as a thorough understanding of the energetics of sound, a good sound healer possesses the presence and knowledge to support clients in engaging with healing in mind, body, and spirit in an intentional way. The underlying goal of any Sound Medicine work is to reset the sympathetic nervous system’s response to ongoing stress. Western medicine now acknowledges that the cumulative effects of stress contribute to nearly every major illness. Living in a culture of busyness, increasing levels of mental and emotional strain escalate into chronic stress, and over time, this can have a serious affect on our health. As the body is continually flooded with stress hormones, heart rate increases, blood pressure elevates, and the digestive system can’t function in an optimal way. Over time, this ongoing state of fight-or-flight can lead to disease, including high blood pressure, heart disease, stroke, ulcers, and immune suppression. Many health professionals now encourage patients to engage in simple and effective practices, including meditation, body awareness, and breathing exercises, to interrupt the cycle of chronic stress, and supporting the body’s natural capacity to heal and return to balance. This is where Sound Medicine is key. While all forms of meditation and self-awareness are beneficial, the part of the brain that engages with sound is directly connected to memory and emotion. Sound Medicine embraces this natural interconnectivity. 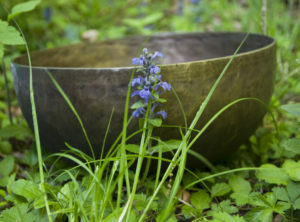 Whether evoking soothing sounds, such as ocean waves or chimes shimmering in the breeze, abstract sounds such as the gong or singing bowls, or the words of a song to guide the exploration of a particular emotional landscape, life experience, or inner inquiry, Sound Medicine engages the parasympathetic nervous system, initiating a deep state of relaxation. In turn, the body is able to come into greater balance, and can result in lower blood pressure, improved digestive function, and nourishment of the body’s tissues and organ systems, not to mention allowing the mind and emotions to enter into calmness and clarity. Ultimately, Sound Medicine is a wonderful tool that can support any healing journey. While it is not a substitute for appropriate medical treatment when facing a serious health condition, as a complimentary modality, it can be very beneficial alongside any allopathic or holistic disciplines. Note: Sound Medicine is not intended to take the place of any allopathic or alternative medical care. While energetic healing and balancing can bring tremendous shifts in the energy body that can, in turn, facilitate deeper physical, mental, and emotional healing, there are no guarantees. If you have serious health concerns, please seek appropriate treatment.